Cold and flu season is upon us. I know. It's only December 6th, and I have been sick three times. Like most people, I try to pinpoint when I got sick. Was it the day I forgot to use the disinfectant wipes on the grocery cart handle? Was it that sneezy kid in the elevator? Ooh, I know who it was -- that guy who hacked all over the coffee counter at Starbucks. I realize that this line of investigation is futile, but when I can't swallow, my ears ache, and my nose looks like Rudolph, I'm looking for retribution. Fortunately, this North African Inspired Sweet Potato, Peanut Butter, and Paprika Soup calms me right down. Roasting the potatoes first ehances their natural sweetness and adds a touch of smokiness that contrasts deliciously with earthy peanut butter and fragrant sweet paprika. After a piping hot bowl of such goodness, looking like Rudolph doesn't seem so bad after all. Want to share in our big, festive Eat Christmas Cookies event? Find out how here. (Several Santa prizes will be given out throughout the event.) And check out the stash of Christmas cookies we've gotten so far. 1. Preheat oven to 400 degrees F. Line a baking pan with tinfoil (for easy clean up). Brush the flesh of the sweet potatoes with 2 teaspoons olive oil; roast flesh side down for 40-45 minutes, or until tender when pierced with a fork. Cool. Scoop out the flesh, and discard the skins. 2. In a deep pot over medium heat, sauté onion in remaining 4 teaspoons olive oil for 5 minutes, or until lightly browned. Add cooked potato flesh and broth. Bring to a boil; reduce to low, and add brown sugar, peanut butter, sweet paprika, and cayenne pepper. Cook 7-8 minutes. Turn off heat, and cool 5-10 minutes before pureeing. 3. 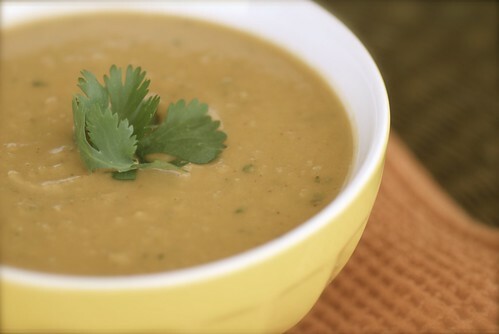 Working in batches, puree the soup in a blender until smooth; return to the pot over low heat. Add the cream, lime juice, and cilantro; stir occasionally until the soup is thoroughly heated, 8-10 minutes. Season to taste with salt. If you prefer a thinner soup, simply add a bit more broth until desired consistency is reached. 4. Garnish individual bowls with thinly sliced fresh cilantro and chopped peanuts. We're fighting the flu here, so need a warm pick me up. And we definitely got infected by sneezing kids :). Anything with peanut butter makes me happy. I'll have to try this out. Feel better soon. Funny, I was just talking about these flavors last night! yum! That is a gorgeous soup! So flavorful and original! Oh noo!! 3 times already?! I hope you get plenty of rest and plenty of delicious soups like this one! This really sounds soo good! I love sweet potatoes, but have never tried them in soup. 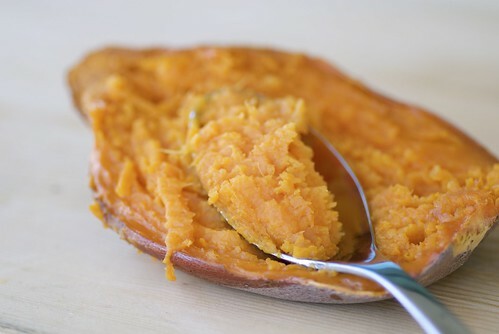 I love the photo of the sweet potato on the spoon! Thanks. Comfort food at it's best Susan. This sounds really tasty! My kind of soup! allthingsyummy-Thanks! I hope you like it. gretchennoelle-What's not to love, right? theteachercooks-Oh, you've gotta try it. They're wonderful! Hope you start feeling better. That soup looks delicious to eat at any time! Soup is definitely the way to go in certain situations. Hope you don't get sick again this season: it's not fun. Thanks so much for metioning my sweet potato soup recipe. Yours sounds incredible, all flavors I never thought to mix. Very interesting. I sometimes make a sweet potato soup with coconut. I am definitely trying this great peanut butter variation. Hope you feel better soon. I always seem to get a bad cold around the holidays and I'm dreading the inevitable arrival of hte next one! This is intriguing - I LOVE the sound of it. Since I am just getting over bronchitis, its just what I feel like! I love to make a version of this soup with a variety of winter squash: a little bit of butternut, buttercup, blue hubbard, acorn, whatever I have on hand. And I always throw in a sweet potato, too. Hope this is the end of the cold/flu season for you! those three sound really interesting together, but it makes sense. i still have some sweet potatoes laying around i could use...but i'll have to make sure my dog's nose doesn't make it into the finished product this time. feel better! What a wonderful, comforting soup, Susan! I hope you feel better soon. it is cold, winter is definitely in effect, and it just so happens i just got sick so tomorrow I am whipping up a batch of this soup and hoping to lose the red nose! With all those peppers and sweet potatoes that soup's gotta' help a cold. Hope you feel better soon. I made your soup last night and my husband & I are enjoying it again tonight! It's is amazing. So easy to make. And with a creamy velvety texture that makes me not want to stop eating this. I loved your Sweet Potato Peanut Pineapple Soup from last year--but this one might be a tad better! So sorry to hear that you've been hit by the cold/flu bug. I swear by the neti pot (can get SinuCleanse at any drug store) at the first vague sign of a cold. Really! Vitamin D in the range of 2000-4000 IUs a day, too, will kick up your immune system. That's so funny - I totally do the same thing, trying to find out who to blame for being sick. Like that's going to change anything. Sorry you're under the weather. A bowl of this beautiful soup is bound to help. A household fighting over flu also here! Kids sneezing and sniffing, we all got infected! Thanks for the recipe. This can help! sounds great! reminds me of a spicy butternut & peanut soup I love to make.